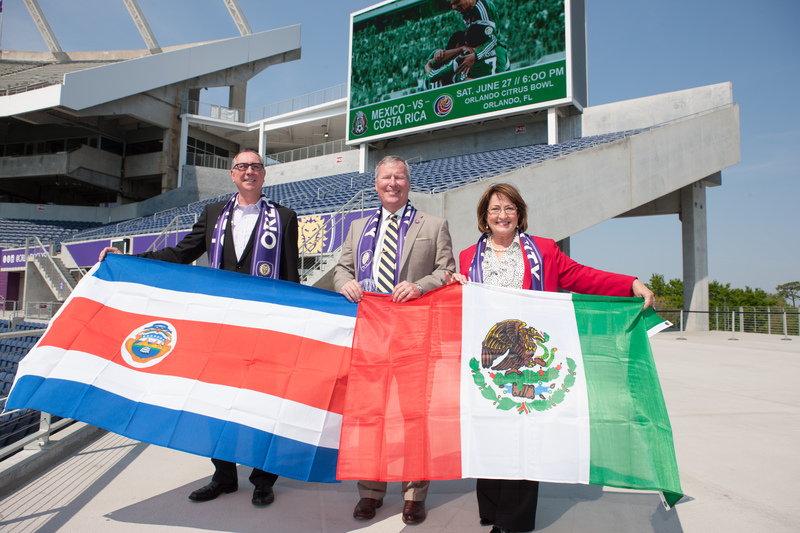 Orange County Mayor Teresa Jacobs recently joined community leaders at the Orlando Citrus Bowl for a major announcement of a friendly soccer match between international rival teams Mexico and Costa Rica on June 27 at the Orlando Citrus Bowl. As part of Mexico’s 2015 U.S. Tour, the Mexican National Team will play the Costa Rican National Team for the first time at the Citrus Bowl since the 1994 FIFA World Cup. Orlando City Soccer Club Founder and CEO Phil Rawlins announced the match at the newly renovated Citrus Bowl stadium with Mayor Jacobs and City of Orlando Mayor Buddy Dyer. The match is described as a crucial practice for both squads as they make final preparations in advance of the CONCACAF Gold Cup, the bi-annual continental championship to be played across North America in July. Capturing the Gold Cup would give the winner a chance to face the United States in a game to qualify for the 2017 FIFA Confederations Cup. More than 62,000 Central Florida soccer fans filled the Citrus Bowl on March 8 for the inaugural match of the Orlando City Lions and the New York City Football Club. Fan attendance was the largest ever recorded for a soccer game at the Citrus Bowl, surpassing previous crowds during the 1994 FIFA World Cup. The game drew the second highest attendance numbers during an inaugural MLS match. An exclusive pre-sale of package ticket plans for the international match will begin on March 23 at 10 a.m. at www.OrlandoCitySC.com. Single-game tickets for the Mexico vs. Costa Rica match will go on sale to the general public on April 15 at 10 a.m. via www.ticketmaster.com or by calling 1-800-745-3000.